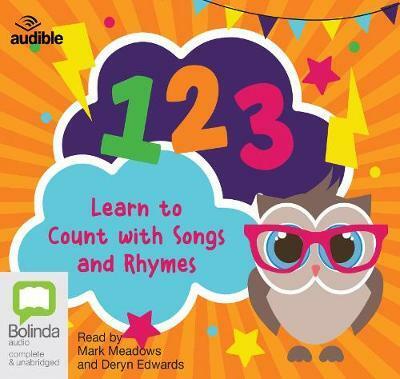 Children can sing along to these catchy tunes to help them learn to count in a fun and exciting way. There's even a cool way to test their learning - with interactive counting to show them how clever they are. Learning has never been so much fun! Mark Meadows is a British actor with extensive theatre, film and TV credits, and is a frequent contributor to plays, musicals, narrations and readings for BBC Radio 3 and Radio 4. He has narrated around 80 audiobook titles and was a nominee for the 2013 Audible Narrator of the Year award. Mark also provided the voice of the ship's computer in Ridley Scott's Prometheus. Deryn Edwards studied at the Guildhall School of Music and Drama and the Royal Academy of Music, and has performed on the operatic stage, as well as in West End musicals. For seven years, Deryn sang with an international acappella vocal group, The Swingle Singers. With the group she collaborated with many of the world's leading orchestras and conductors, and performed in venues such as Carnegie Hall, The Lincoln Centre, La Scala in Milan and the famous Ronnie Scott's Jazz Club in London.